It is McIlroy’s ninth European Tour International Schedule victory in his 140th European Tour event. It extends his lead at the top of the Official World Golf Ranking. He goes to 11.2701. It is also his fourth European Tour victory of the 2014 season, following the BMW PGA Championship, The 143rd Open Championship and WGC – Bridgestone Invitational. It is the first time he has won four times in a European Tour season and is the first Irishman to achieve the feat. It is McIlroy’s second consecutive Major Championship victory, following The 143rd Open Championship. McIlroy becomes the first player to win back-to-back Major Championships since Padraig Harrington (2008 Open Championship and 2008 USPGA Championship). He becomes the 16th different player to win back-to-back Major Championships in two different Majors. He joins Nick Price (1994), Tiger Woods (2000, 2006) and Padraig Harrington (2008) to win The Open Championship and US PGA Championship in the same year since 1958 when the US PGA Championship became stroke play. Walter Hagen achieved the feat in 1924 when the US PGA Championship was match play. Having won The 143rd Open Championship would become the 18th different player to win two of the four Major Championships in the same season. In all this feat of winning two in one season has been done 31 times in Major history. McIlroy has now won four Major Championships. They are: 2011 US Open Championship, 2012 US PGA Championship, 2014 Open Championship and 2014 US PGA Championship. At aged 25 years and 98 days he is now the fourth youngest player in Majors history to win four Major Championship. He stands behind: Young Tom Morris (1872 Open Championship – 21), Tiger Woods (2000 Open Championship – 24) and Jack Nicklaus (1965 Masters Tournament – 25). 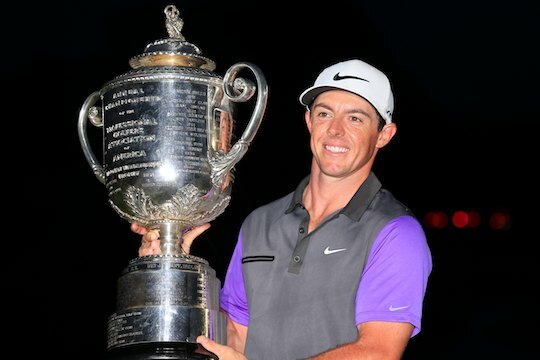 Rory McIlroy becomes the 18th different player to record multiple US PGA Championship victories. Of those 18, would be the tenth when the event was stroke play. Aged 25 he is the second youngest player to win the US PGA Championship as a stroke play event. The youngest is Tiger Woods, aged 24. His fourth Major Championship comes in just his 25th career Major Championship. He wins a second US PGA Championship victory in his sixth appearance. It continues an astonishing record in the US PGA Championship. He was tied third in 2009 and 2010, tied 64th in 2011, first in 2012, tied eighth in 2013 and first in 2014. McIlroy becomes the 11th different player to win an event the week before a Major and then win the Major in the next event. Phil Mickelson is the only player to have done this twice. Sandy Lyle is the only other player from the United Kingdom to achieve the feat. He won the 1988 Greater Greensboro Open then the 1988 Masters Tournament. McIlroy completes a ‘Kentucky Treble’ and follows Tiger Woods who in 2007 who won the WGC – Bridgestone Invitational then won the 2007 US PGA Championship the following week. McIlroy becomes the first player to win in three consecutive European Tour appearances since Martin Kaymer in 2010. He won the US PGA Championship, KLM Open and Alfred Dunhill Links Championship). McIlroy becomes only the fourth European Tour Member top win four or more Major Championships, after Sir Nick Faldo (six), Seve Ballesteros (five) and Ernie Els (four). McIlroy has now won four of his last seven European Tour events. McIlroy has now won all four of his Major titles when leading going into the final round. He becomes the fifth European Tour victory in the US PGA Championship since 2008. McIlroy becomes only the eighth European-born victory in the US PGA Championship. He joins England’s Jim Barnes (1916, 1919) as the only other European-born player to win two US PGA Championship titles. Aged 25 years and 98 days McIlroy is the youngest European Tour Member to win four Majors. It also is the 49th Major Championship victory by a European Tour Member since 1979. It is McIlroy’s sixth of his nine European Tour titles where he has led or shared the lead going into the final round. It becomes the 14th time this season where the 54 hole leader has gone onto win. It is the 32nd time the 54 hole leader has gone onto win the US PGA Championship since it became stroke play in 1958. He is the 12th player in European Tour history to win four official events in a single season. McIlroy’s victory is the 54th Northern Irish win in European Tour history. McIlroy becomes the fifth Northern Irish victory of the season. They are: Rory McIlroy (BMW PGA Championship, The 143rd Open Championship, WGC – Bridgestone Invitational and US PGA Championship) and Graeme McDowell (Alstom Open de France). McIlroy moves to move over €21 million in European Tour Official Career Earnings having broken through the Euro 20m in capturing last week’s WGC – Bridgestone Invitational. Moves to 534.26 in The Ryder Cup World Points List. It is McIlroy’s 15th victory as a professional.